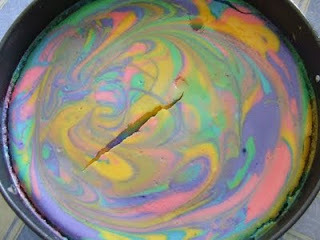 Inspired by Beth's posts regarding the tie-dyed cheesecake she and her family experienced on their vacation to Disneyworld in May and their own attempt to recreate this visually trippy and quite tasty treat in August, I had to make my own. Except I felt it needed the right touch and frankly, Israeli food coloring just wasn't going to cut it. Besides the fact you tend to need a lot of the food coloring to get even a decent pastel going, the local supermarket has at most 3 colors... and when mixed I'd have 6. But I wanted the vibrant colors Beth had in Disney. Unfortunately I got my dates mixed up and by the time I called my brother, my aunt was already on her way to the airport. But I was in luck. My brother's BIL was coming to Israel at the end of the summer. 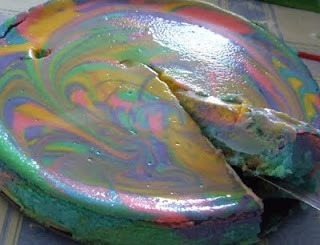 So he brought it to Israel and SR picked it up in Jerusalem and I had the final ingredients to make tie-dyed cheesecake... in addition to some really cool tubes of icing... which sparkle! IMO, the actual recipe doesn't really matter, as long as it tastes good, so if you already have a basic cheesecake recipe that works for you, feel free to use it. I decided to go a bit decadent and use the Philly Northwest Cheesecake Supreme recipe but left out the cherry pie filling and did a few extra steps to make it tie-dyed. Combine graham cracker crumbs, 3 tablespoons sugar, and melted butter. Press onto the bottom of a 9-inch springform pan. Bake at 325°F (160°C) for 10 minutes. Meanwhile, combine cream cheese, 1 cup sugar, and flour; mixing at medium speed with an electric mixer until well blended. Add 4 eggs, one at a time, mixing well after each addition. Blend in sour cream and vanilla; pour into 6 or so smaller bowls to add the food coloring. After each bowl is blended with the color you want, start pouring into the pan - about 1/3 of each bowl, then repeat the process until all the bowls have been scraped clean with a spatula and added to the pan. Very gently swirl the colors together. Be careful not to over mix. Bake at 450°F (230°C) for 10 minutes. Reduce the temperature to 250°F (120°C) and continue baking for 1 hour. Loosen the cake from the rim and cool before removing. Chill. So, what does one use for cream cheese and sour cream in Israel? g'vinah levanah and shamenet hamutzah? I'm serious. I never quite figured this one out. I have yet to find alcohol free vanilla in Israel. Any ideas?